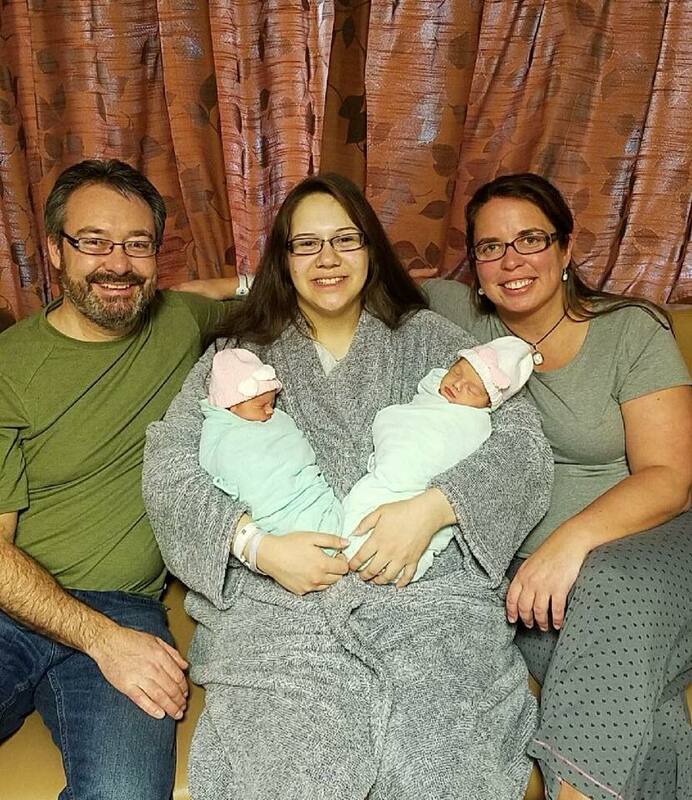 Jeri Lynn and Michael have been the proud parents of twin girls, Anna and Avery, since their birth on June 14, 2018. Anna and Avery were born a few weeks early and spent some time gaining weight and strength in the hospital before being discharged directly into the care of Jeri Lynn and Michael. The girls are healthy and happy and their parents are enjoying every minute with them! The couple hopes to finalize Anna and Avery’s adoption in the next couple months and is looking forward to starting more traditions as a family. They spent their first holiday season together as a family of four and Anna and Avery couldn’t be more adorable in their matching outfits! Thank you to Jeri Lynn and Michael for sharing some of their journey with us and we are so happy for you and your family! Welcome to the world, Reese! This happy baby girl was born on August 13, 2018 and weighed 8 pounds 1 ounce. Her parents, Kayla and Nate, have enjoyed getting to know Reese’s birth mother over the last few months of her pregnancy and after birth. Kayla and Nate have been Reese’s sole caregivers since her discharge from the hospital, a little over 6 weeks ago. Reese has been thriving in their care and is a super happy baby! Kayla and Nate are overjoyed to have their baby girl in their lives. Even the family dog, Macy, is loving having a new baby at home! Thank you, Kayla and Nate, for sharing your story with us. We are so excited for your future with Reese and can’t wait to share more photos of her as she grows! My name is Morgan. I got pregnant when I was fifteen. He was conceived at the end of June and I didn’t find out that I was pregnant until August, a month after my sixteenth birthday. My first mistake was waiting so long to tell anybody. My mom found out from my older sister because I was too scared to tell her myself. My sister was actually the one who had helped me find the adoptive parents that I chose. The hardest thing that I ever had to do was meet with the adoptive parents. My first questions to myself were, “what if they don’t like me?” or “what if after I have this baby they never want to talk to me again?” You might think “what if I don’t find a family that I like”, and to be honest that’s what I thought too. You can’t think negative! That is the worst thing you could do. From the moment I read David and Danielle’s(adoptive mother and father) bio I knew they were who I wanted to raise my baby, not because I didn’t want to raise him but because I wouldn’t be able to give the precious human the life that he deserved. This leads to the other most important part to me. I do have an open adoption. David and Danielle give me updates about two times a week(most of the time). This baby boy was born May 30, at 5:00 a.m. exactly and I will never forget that date until the day I die. Knowing that I gave the best gift in the entire world to best, most kind-hearted, sweet, human beings to have ever walked this earth. I actually met David and Danielle the day before I had my baby. I was in labor while I met with them! The first question that I asked is if Danielle wanted to be in the delivery room with me. Of course she said yes. It was a good bonding time for the both of us to be together at that moment, and she held my hand through all of it. She did the skin to skin because that would just be another attachment that would be hard to let go of. I am not going to lie to any of you reading this. This was the hardest thing I have ever had to do in my life. All I think when I get these feelings are “He is with the people that I trust the most right now.” The other thing that I have that I look at when I get upset is a scrapbook. I actually have two scrapbooks, one for the pictures of updates they give me and the pictures of his month check-ins, how much he weighs. The other one I have is one for all of the times that we meet so I can watch him change and grow as I flip through the pages. These are a big help. It gets better I promise. I just did some of my senior pictures and I met up with them! It was my seventeenth birthday. The best birthday I could ever have was spent with the little boy that was growing in me for 9 months. I held him, I talked to him, I kissed him and it all felt normal to me. It was never awkward, it was amazing that I still feel like his mother. When I handed him back to Danielle he looked at me for 5 almost minutes and this may be silly, but it felt like he still had a connection with me and almost knew who I was. He is now 4 months and 6 days old and he is the most handsome little man I have ever laid my eyes on. David and Danielle got me a Birth Mothers Day gift, which was a picture of the sweet baby framed, a card and a few other things and I keep that picture and the cards that they had gotten me by my bedside so I can wake up and always see a picture of why I’m still going strong with my decision. If you do this you will be giving someone the most precious gift that you can give to someone that can’t have their own little miracle. To this day I still talk to the family, get updates and we even talk about how we are. This family has my heart and they will always have my heart as long as I’m still here! Happy Adoption Day, Anna! Anna and her parents, Eva and Jeff, celebrated the finalization of her adoption in court on July 25, 2018. Anna was born on March 20, 2018 and was placed directly from the hospital into the care of her adoptive parents, Eva and Jeff. Anna's birth had no complications and she was healthy upon delivery. The couple enjoyed an open adoption with Anna's birth mother prior to the birth, and they plan to continue having contact with her in the future. Anna's day in court was very special, because the judge presiding over the finalization hearing was usually a judge in criminal proceedings. He had asked to be a part of Anna's special day because of his own connection with adoption. The judge and his wife adopted their daughter when she was an infant, and his daughter, now seven years old, was present in the courtroom for Anna's adoption hearing. The judge's daughter helped push Anna's stroller into the courtroom, and everyone was a little teary-eyed after the finalization took place. Eva and Jeff told AOW that the moment was very special for everyone to witness. Anna was so excited that she even rose her hand for the oath! After the hearing, the family of three went to the Capitol to take some photos. Eva and Jeff had wedding photos done at the Capitol when they were married, and now they have adoption photos with Anna there, too. They celebrated with a cake at home later that day! Thank you, Eva and Jeff, for sharing your adoption journey with us. Anna is very loved by all around her and we are excited to watch her grow. We wish you all the best! Happy Adoption Day, Leon and Noah! A double dose of congratulations to Kelly and Neil, who finalized the adoption of both their sons, Leon and Noah, on July 11, 2018! Congratulations to Clark and his parents, Katie and Jake, who finalized Clark's adoption on June 25, 2018! Clark was completely at ease during the hearing, which calmed his parent's nerves. Judge Mitchell presided over the finalization and Katie and Jake reflected that he was incredibly warm and kind to their family. Clark's family members traveled from New York City, Chicago, Milwaukee and Madison to be there for his special day. Afterward, everyone enjoyed a late breakfast to celebrate the occasion! Thank you, Katie and Jake, for sharing your adoption journey with us! We wish you nothing but the best moving forward and we can't wait to see updates of Clark a few months from now! Happy Too Cute Tuesday! Baby Anna is going to be 4 months old on July 20, and she is already stealing the hearts of everyone who meets her. Anna was born on March 20, 2018 and was placed directly into the care of her adoptive parents, Eva and Jeff. This bundle of joy is thriving in the care of her parents and loves sleeping through the night, which her mom and dad are lucky enough to say! Eva and Jeff have an open adoption with Anna's birth mother and feel that this is in the best interest of Anna and everyone else involved. They have enjoyed getting to know her birth mother and spend time with her when they get the chance. Eva and Jeff both celebrated their first Mother's and Father's Day as parents to Anna, and their sweet baby girl showed off her love for her dad in a photo shoot! Anna loves exploring and is starting to roll over on her sides. She always dances and laughs when music is playing and she likes pulling at her toys that hang above her on her play mat. Her parents are getting excited to finalize her adoption in the near future! Stay tuned for an adoption day story. Happy Adoption Day, Carter! This handsome baby boy celebrated his adoption finalization with his dads, Scott and Troy, on Tuesday, June 19, 2018. Carter was born on December 22, 2017 and was placed directly into the care of Scott and Troy from the hospital. Scott and Troy formed a bond with Carter's birth parents from the start of the matching process and continue to have an open adoption relationship today. Carter's birth mother and father spoke at a recent AOW Waiting Family Group about their experience with open adoption and how their feelings have changed after placement and the termination of their parental rights. Carter's birth mother spoke honestly and confidently about her decision to place Carter with Scott and Troy. She spoke highly of her choice in adoptive parents for her son, and stated that she feels comfortable continuing their relationship into the future. Claire Schulz Bergman was the social worker who worked with both Scott and Troy and Carter's birth parents throughout the process. Claire enjoyed working with both families to facilitate their matching and placement processes. Claire reflected on the adoptive couple and had this to say about them, "Scott and Troy were so wonderful to work with. Baby Carter has so many people who love him! The care and respect that Scott and Troy showed Carter’s birth parents throughout this whole process is heartwarming. Carter will only benefit from the relationship that his parents have with his birth parents. It takes a village!" Claire is going to miss the monthly visits with Carter during post placement, but is happy that this family of three is complete. AOW thanks Scott and Troy for their openness with Carter's birth parents and we wish them the best of luck in the future! Using positive adoption language means taking care to choose the words that are accurate and respectful to all those involved in the adoption process. It really is a new language to learn when you first begin the adoption journey, but it becomes intuitive the more involved you are. Below are a few examples of some commonly misconstrued phrases in adoption. A person planning to place a child for adoption is an “expectant parent”, if the baby is not yet born. That person is a “birth parent” after the child is born. Referring to the expectant or birth parent as the “real” or “natural” parent diminishes the role of an adoptive parent chosen by the expectant parent and can imply that the adoptive placement is temporary, or not “real”. The expressions, “give up for adoption” or “surrender”, imply that the expectant parent(s) are giving their child up because they don’t want the child, or are simply throwing in the towel. In reality, the expressions “choose adoption” or “make an adoption plan” reflect the choice that the expectant parent makes when moving forward with an adoption, and honors his or her decision-making process. When an expectant or birth parent makes an adoption plan, he or she is making a significant parenting decision for that child. Even after the adoption is finalized, we sometimes refer to the parents as “adoptive parents.” They have adopted, but they’re really just the parents, like any other legal parents. Expectant parents and adoptive parents have important roles in the adoption process and to the child at the center of the adoption triad. We can accurately and sensitively refer to the adult members of the triad who all care about the child’s best interests. But, we all stumble over our words, sometimes, so if you are ever wondering about terminology, AOW’s social workers are happy to talk through it, without judgment. Attorney Lynn Bodi and Executive Director Claire Schulz Bergman got to appear in court with a birth mother in another county, recently. It was one of the nicest hearings we’ve been to. This birth mother had made an adoption plan for her son. She was very clear in what she wanted for him. The hearing was lovely and the birth mother’s mother was also there to support her. At the hearing, the judge thanked everyone in the room for being the high point of his day. Q) What did you find the most surprising about court? A) There was really nothing that surprising. I felt like I was really well prepared. Q) Was any part of court scary for you? A) Just talking in public. [Her mom then pointed out that she’s a little shy.] But I knew what you were going to ask me. All of the information made sense. Entering a courtroom can often seem daunting. At Adoptions of Wisconsin, we take pride in helping everyone involved in an adoption feel comfortable and well prepared. Welcome to the World, Anderson! Welcome to the world, little Anderson! This bundle of joy was born on March 30, 2018. He was placed directly into the care of his adoptive parents, Danielle and David. The couple has spent the last two months loving, caring and cherishing Anderson. Danielle and David had very little time to prepare for the birth of their son. A birth mother found AOW's website and felt instantly connected to Danielle and David as she viewed their photos and profile. Within days, the couple met with the birth mother, formed a match and before anyone could process it - Anderson was born. After a successful delivery and birth, Danielle and David were discharged from the hospital with Anderson. The family dogs, Bailey and Winnie, were excited to welcome Anderson home, too! We're excited to see Anderson's growth over the next months in post placement before finalization. Congratulations, Danielle, David and baby Anderson! Kelly and Neil came to Adoptions of Wisconsin in early 2017 with the hopes of adopting an infant - as many families do. As the couple progressed through the inactive list and began the home study to become an active family, a situation was presented to them. This situation involved a sibling group of two little boys, ages 2 1/2 years and 11 months. Kelly graciously reflects on her and Neil's adoption journey in a touching narrative below. I keep wondering how it is possible to have a life so perfect, however one year ago I felt completely different. me, but I felt hopeless. We had always dreamed of growing our family through adoption, but the expense associated with adoption seemed overwhelming and for a young couple fresh out of graduate school it seemed improbable. My husband and I attended an infertility support group where a young woman shared she had completed 8 rounds of in vitro fertilization (IVF) over a 5 year period and still did not have a baby in her arms. As we drove home from that group I decided we needed to shift our focus. I started to read blogs about how to make adoption happen. However, it seemed like a stretch, it was nearly half of our combined annual income. We decided we were going to do everything we could to make our dream of adoption and growing our family a reality. When it came down to coming up with the funds, we were overwhelmed by the love and support we received from family, friends and even strangers. We had paint nights, bake sales, garage sales, salon days, friends selling homemade goods, and friends’ crowdfunding. We began to live on a very strict budget, my husband drove Uber during Badger games, and we dog sat for 6 months straight. We had everything planned to a T and with this plan in place we were on track to have the funds for our adoption in one year. Many people told me over the past five years that having a family is something you can’t really plan for and that there is nothing that will fully prepare you for that exact right time. Our adoption waiting period went quite a bit faster than we had planned. Within 6 months of being on the inactive list, we had moved up the queue, and we’re ready to go active! Once active we were under the impression that we would likely wait some more, meet a few expecting mothers and eventually someone would pick us to parent their child. We had names picked out and I dreamt of doctors visits with the expecting mother where we would see our baby together. However, the day we finished our home study and were asked if we would consider a sibling set? We were unsure if this was something we could handle. We had no idea what a sibling set even meant. Our social worker explained the situation and what exactly a “sibling set adoption” entailed. Later that day she emailed pictures of the “sibling set” and asked if we would like to have a profile shown to the birth parents. This was not what we had planned for, but over the years we’ve learned you can't plan for everything. So we decided we might as well give it a shot and see if she liked us. A week later we met a courageous young woman, who wanted the best life for her boys. At this same visit we met two little boys- ages 11 months and 2 ½ that have forever changed our lives. It was love at first sight. After that visit we left and drove home not knowing if she had liked us, but knowing we were fully in love with all three of them. Adoption is hypothetical during the preparation process---we thought about how we would parent, but we didn’t have any really practical experience. But when you meet the birth mother---and in our case, the kids too---the thing is real. These kids would actually be our family. How will they adjust? How will we? Lots of potential issues that we had dismissed or delayed suddenly became real. The scenario we had been mentally preparing for---taking home one newborn baby---was instantly totally different. We were mainly worried that they would not attach to us. About two weeks after our initial meeting we took two little boys home to our semi-toddler proofed house and started our journey as parents.It turned out that, at least in terms of attachment, we had nothing to worry about. The boys were attached to us almost from the moment we brought them home. Both of them love us like we’ve been their parents from the beginning, and we love them the same way. young people that created these beautiful babies and made this selfless decision. Every day we look at these beautiful boys we are so grateful. We are grateful for the opportunity to love these boys and to grow our family. Unconditional love is powerful. Unconditional love is true. Unconditional love makes a family. Congratulations to Bethany and Jeff on finalizing the adoption of their son, Matthew! Just one day after Mother's Day on May 14, 2018, Matthew's adoption was finalized in court. Matthew was born on December 18, 2017 and was placed with Bethany and Jeff a few days later. He has been welcomed into the family with open arms and has been showered with love and attention from his parents and big brother, Marcus. Big brother Marcus was lucky enough to be able to help finalize Matthew's adoption with help from the judge. Congratulations Bethany, Jeff, Marcus and Matthew! We're so excited for your bright future together. Your pet was your first baby. Your pet is a real and important part of your family, so it's important to prepare Fido or Tabby for the arrival of a baby. A baby will be a new, loud, wonderful, and disruptive part of your home life. Here are a few tips to make baby's arrival a little less disruptive or scary for your pet. Adults know to treat a pet gently. A baby doesn't know this, which means that you need to prepare your pet for this new kind of interaction. Children love to poke, grab, and explore their environment. If your pet is skittish and not used to this kind of incidental contact, you should prepare by exposing them to this. Gently poke your pet's sides while you pet it, play with their feet, and rub their tail and face. Reward them consistently for good behavior during this so that they begin to equate it with praise and rewards. If your pet is ready for the baby, they can become fast friends! Gently introducing your pet to your baby is crucial for both your baby's and your pet's well-being. Use positive reinforcement and practice to teach your pet that they are your partner in protecting and caring for your baby, and not a competitor with the baby for your affection. This will help to take care of the emotional and mental health of your fur baby, and your people baby. If your pet likes treats, practice calling him away from the baby, or the baby's toys, then reward him with a treat each time he listens to you. Planning for your new baby and preparing your pet as early as possible are the two keys to a successful pet-baby relationship. Once a pet understands that the baby is not a threat and has your seal of approval, the pet and the baby can develop a deep and lifelong bond that's unrivaled by almost anything else. However, no matter how affectionate your pet is, never leave a child unattended with a pet - for both their safety. Happy Adoption Day, Jaiden! Jaiden's adoption was finalized in court on April 18, 2018. He was with his siblings and parents on his big day and he seemed to enjoy appearing in court before the judge! Haiden, Jaiden's biological older brother, was adopted by Mel and Jon at birth in 2010. Jaiden's birth mother parented Jaiden from his birth in 2014 until he was placed with Jon and Mel in November 2017. Jaiden's birth mother reached out to Mel and Jon late last year when she decided that she could not provide her son with the life that she wanted him to have. She also wanted him to have the opportunity to be raised alongside his biological brother, Haiden. Mel and Jon readily accepted the unexpected role of becoming parents again, and welcomed Jaiden into their family. Jaiden is an energetic four-year-old who has adapted well to his placement with his parents and siblings. He shares a room with his older brother and seems to have developed close relationships with his sisters, too. At his adoption finalization hearing, Jaiden excitedly announced himself and introduced his siblings to the judge. We are excited to see this family grow into a family of six! Congratulations Jaiden, Mel and Jon! Happy birthday to the cutest two-year-old, Desmond! Evan and Chad are the proud parents of this toddler and are currently active with AOW's Outreach program in their pursuit of a second adoption. 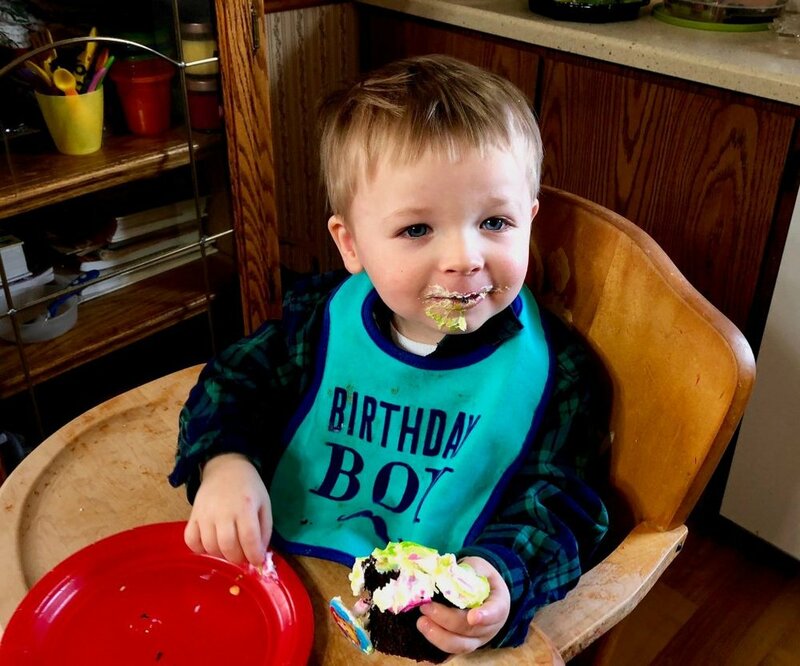 Desmond celebrated his second birthday on March 30th with friends and family. Affectionately called "Desi" by his parents, Desi had a Daniel the Tiger themed birthday party (his favorite television show). The party was held at his Grandma and Grandpa's farm on the 30th. Desmond's adoption was finalized on November 4, 2016. His parents, Evan and Chad, are a waiting family in AOW's Outreach program. They are hopeful that they will soon be matched with the perfect birth mother to give Desi a little sister or brother to play with and help take care of. Desi loved his special cupcakes with lime green frosting and fashionable Daniel the Tiger rings. It's hard to tell if he even ate much of the cupcake, as a lot of it ended up on his face! Happy Birthday, Desmond! We can't wait to see you be a big brother someday soon! Time flies when you're having fun- Clark is almost 4 months old already! Adoptive parents, Katie and Jake, love being parents to this little guy. Katie and Jake opened up about their adoption journey to a local photographer and blogger, Karly Jo Photography. These adorable photos were taken by her and posted on her website on March 22, 2018. Katie and Jake's bundle of joy was born on December 18, 2017. He is rapidly growing and starting to move around a lot more lately! AOW has observed Katie and Jake as attentive, loving and brilliant parents to Clark since his arrival into their care in early January. For Katie and Jake, it was love at first sight when they met their son, Clark. They knew that he was meant to be their son and they were meant to be his parents. 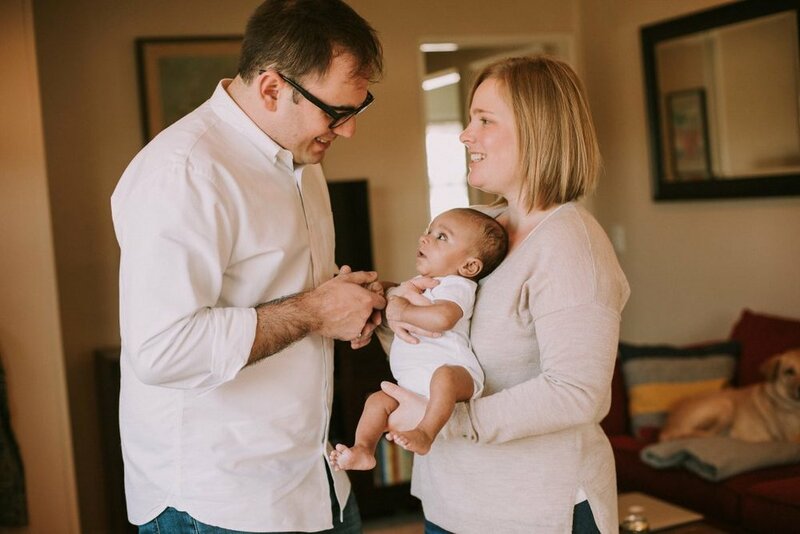 We're very excited that another family was created through adoption and we know that Clark will only grow in the love he's surrounded with from his parents. Congratulations! You’ve been matched. Odds are that, as waiting adoptive parents, you're looking for ways to pay for adoption, or you have already paid or incurred agency fees. Now you will have more expenses, which may include birth parent expenses, agency fees, attorney fees and travel expenses. Even though this is the happiest and most significant event in your life, adoptive parents have the same responsibility as other parents to be good stewards of their families’ finances. Adoption of Wisconsin’s owner, Attorney Lynn Bodi, recently shared some other resources with us. Lynn is proud to be a 20-year Fellow of the Academy of Adoption and Assisted Reproduction Attorneys (AAAA). In honor of its 25th anniversary, the AAAA created the Family Formation Charitable Trust to help build families through adoption and assisted reproductive technology. More information and applications for grants can be found at: http://www.adoptionattorneys.org/aaaa/charitable-trust. Welcome to the World, Harper and Hadley! We are very excited to announce the arrival of AOW's newest babies - a beautiful set of twin girls born last month. Adoptive parents, Julie and Tom, have developed a strong open adoption relationship with the babies' birth mother, Megan. Harper and Hadley were born on February 22, 2018. Both girls were healthy newborns and birth mother Megan had a successful recovery. The photo above was taken after the twins' birth in the hospital. 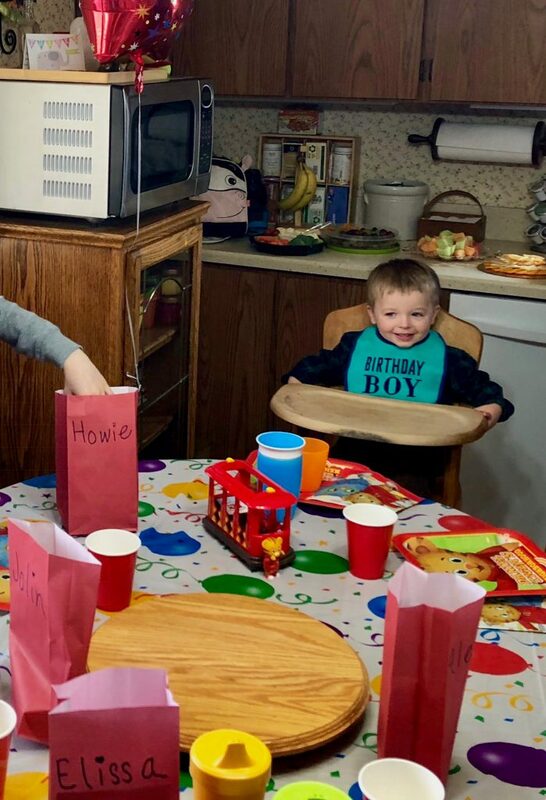 Megan, Tom and Julie have formed a close bond throughout the adoption process, and both adoptive parents were in the hospital when Harper and Hadley were born. Welcome to the world, Harper and Hadley! We are excited to document their growth and development over the next 6 months in post placement. Congratulations to all! Welcome to the world, Anna! Precious baby Anna was born on March 20, 2018, and went home with her parents last week. Anna's parents are happy to be home and are settling into first routines. She is their bundle of joy and has certainly garnered their attention by being completely lovable and adorable. She's also demonstrated the strength of her lungs with a few loud cries! We are very excited to welcome another little one home with her forever family. She was rocking the pink bow on her hat in her car seat below! Check in for future updates about Anna!